The Avon Extra Lasting Makeup collection came out this past summer and I've been hanging on to it waiting for cooler weather because strangely I have a harder time keeping my makeup on when the weather gets cold then I do when it's hot! 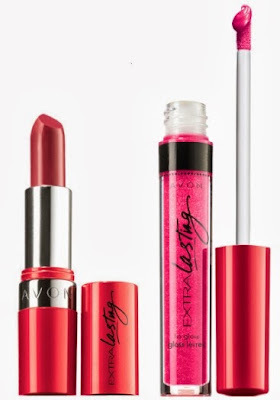 Lipstick - $12 - with a formula that offers up to 24 hours of high-definition colour that's infused with vitamin E and wheat protein to keep lips from feeling dry. I don't find the formula drying at all and the colour lasts so well that I don't feel the need to reapply during the day. I have been applying lip balm on top after lunch just because I'm used to having to apply something and even that doesn't mess up the lasting power! Lip Gloss - $12 - up to 8 hours of shine and luminosity - I find the problem with long lasting lip glosses is that they tend to feel tacky and while this one isn't as bad as some, it does have a stickiness to it which I suppose is what makes it last as it doesn't slide right off your lips. Eye Liner - $12 - waterproof liquid liner that stays true up to 8 hours. Cream-to-Powder Foundation - $15 - offers medium coverage with SPF 15 for 18 hours of worry-free wear. Liquid Foundation - $15 - with SPF 12 - looks natural stays fresh for 18 hours. Pressed Powder - $12 - with SPF 15 and a shine-free finish that wears comfortably for 18 hours. Concealer - $12 - wears flawlessly and looks natural for 18 hours.